Why doesn't AltAnalyze run GO-Elite by default? Answer: GO-Elite provides a useful way to get pathway over-representation statistics for your AltAnalyze gene expression and alternative exon results. Since the list of regulated genes from these analyses can be large it is often useful to first obtain the gene expression and alternative exon results before running your pathways analysis. However, the user can choose to also run this immediately after obtain the initial results. 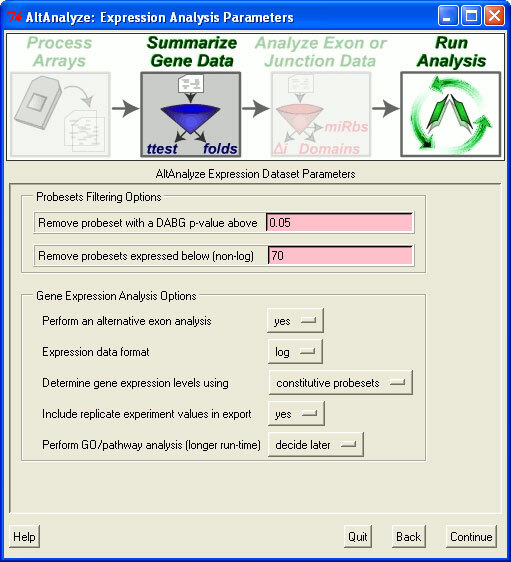 If so, the user should select the option "run immediately" rather than "decide later" from the Expression Analysis options menu. The default "decide later" is set, since this analysis can take up-to-an hour per comparison.